QuickBooks has become the leading accounting software for small businesses because of its user-friendly platform, customizable options and affordable pricing. 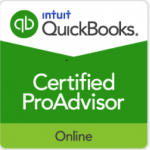 Our team includes Certified QuickBooks ProAdvisors who are trained to help you with everything from installation to integration with compatible software. We will work closely with you to determine your software and accounting needs and then help you enter all of the necessary data and information and get everything up and running. With years of hands-on experience, we can provide training, valuable insight and helpful tips to get the most out of the software. If you are already using QuickBooks, Taurus CPAs offers extensive support for both the online and desktop versions. We can provide bookkeeping assistance, one-on-one or group training, on-going accounting oversight, general ledger clean up, preparation of financial statements and customization of your QuickBooks program.